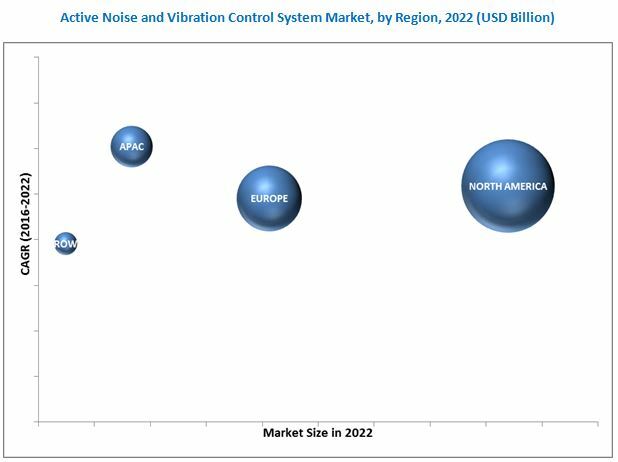 [133 Pages Report] The active noise and vibration control system market is projected to grow from USD 2.16 Billion in 2016 to USD 2.93 Billion by 2022, at a CAGR of 5.15% during the forecast period. The base year considered for the study is 2015 and the forecast period is from 2016 to 2022. The report analyzes the active noise and vibration control system market based on component (hardware and software), application (noise and vibration), and platform (commercial and military). These segments and subsegments have been mapped across major regions, namely, North America, Europe, Asia-Pacific, and Rest of the World (RoW). The report provides an in-depth market intelligence regarding the active noise and vibration control system market and major factors, including drivers, restraints, opportunities, and challenges that may influence the growth of the market, along with an analysis of micromarkets with respect to individual growth trends, future prospects, and their contribution. The report also covers competitive developments, such as long-term contracts, agreements, and research & development activities in the active noise and vibration control system market, in addition to business and corporate strategies adopted by key market players. Market size estimation for various segments and subsegments of the active noise and vibration control system market has been arrived at referring to varied secondary sources such as Airbus and Boeing Aircraft Market Outlook, ICFI Aerospace and Raw Material Outlook, Federal Aviation Administration (FAA), and Avalon World Fleet Forecast, annual reports and publications, among others. Further market triangulation has been performed with the help of statistical techniques using econometric tools. All percentage shares, splits, and breakdowns were determined using secondary sources and verified through primary sources. All possible parameters that affect the market have been accounted for, viewed in extensive detail, verified through primary research, and analyzed to acquire the final quantitative and qualitative data. This data is consolidated with detailed inputs and analysis from MarketsandMarkets, and presented in this report. The active noise and vibration control system market ecosystem comprises system manufacturers, such as Lord Corporation (U.S.), Ultra Electronics Holdings plc. (U.K.), and Moog Inc. (U.S.). 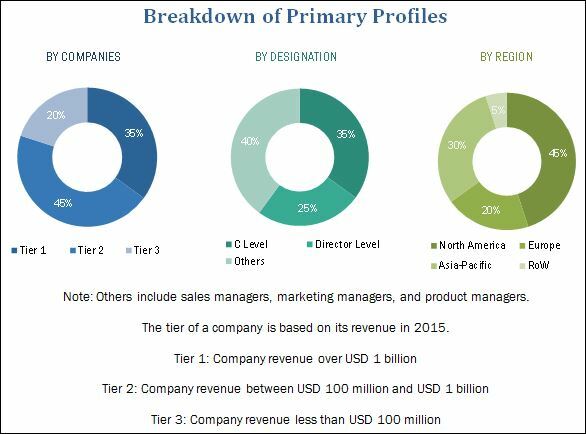 Major customers of the active noise and vibration control system market include commercial aircraft manufacturers and general aviation aircraft manufacturer. Active noise and vibration control system market is projected to grow from USD 2.16 Billion in 2016 to USD 2.93 Billion by 2022, at a CAGR of 5.15% during the forecast period. Active noise and vibration control system is used for noise cancellation and vibration damping, generated from different parts of engine. This system requires high precision and performance. Major sources of noise and vibration in aircraft are engine and structure. The need for enhanced passenger comfort and increase aviation passenger traffic are some of the factors anticipated to drive the growth of the active noise and vibration control system market. In addition, rise in investments to upgrade from passive to active noise and vibration control system is expected to fuel the demand for ANVC system. The active noise and vibration control system market has been segmented on the basis of component, application, platform, and region. Based on component, the active noise and vibration control system market has been classified into hardware and software. The hardware segment includes subsegments, such as sensors, controllers, actuators, and pilot & crew communication systems. The software segment is expected to witness high growth from 2016 to 2022, owing to the rising adoption of digital active noise and vibration control systems. Based on application, the active noise and vibration control system market has been segmented into noise and vibration. The vibration segment is expected to witness high growth during the forecast period, owing to increasing deliveries of rotary wing and turboprop aircraft. Based on platform, the market has been segmented into commercial and military segments. The commercial and military segment have been further classified into fixed wing and rotary wing. The fixed wing subsegment of the commercial segment has been classified into light aircraft, narrow body aircraft, wide body aircraft, very large aircrafts, regional jets, and business jets. The commercial segment is expected to lead the active noise and vibration control system market in 2016. Based on region, the active noise and vibration control system market has been categorized into North America, Europe, Asia-Pacific, and Rest of the World (RoW). Several emerging countries, such as China, India, and Japan, among others are increasingly investing in the development of general aviation. The market in Asia-Pacific is projected to witness high growth from 2016 to 2022, due to rise in aircraft deliveries in the region. Component reliability issues of active noise and vibration control system can restrain the growth of the market. Products offered by various companies in the active noise and vibration control system market have been listed in this report. The recent developments section of the report includes recent and important developments made by various companies between 2012 and 2016. Major companies profiled in the report include LORD Corporation (U.S.), Ultra Electronics Holdings plc. (U.K.), and Moog Inc. (U.S.). Contracts accounted for a major share of all growth strategies adopted by leading players in the active noise and vibration control system market. This strategy has enabled companies to strengthen their market share in the active noise and vibration control system market.